Hundreds of students from 27 schools throughout the state will be participating in the “Stop if You Love Me” campaign from Feb. 12 to 15 to promote safe driving. During the campaign, the Department of Educationʻs Driver and Traffic Safety Education Program will work with student advocates to encourage drivers and passengers to avoid dangerous habits like cell phone use, texting, driving while intoxicated, road rage, speeding, lack of seatbelt use, and passenger distractions. The student advocates will also spread the message about dangerous driving habits with fellow students by distributing more than 20,000 campaign items, hosting presentations and sign waving events, and encouraging students to sign a safe driving pledge. 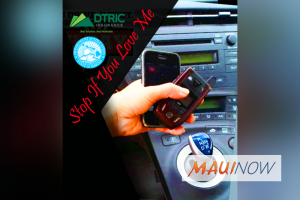 DSTEPʻs Jan Meeker said the campaign is an important and timely reminder to both student and parent drivers on driving and riding safely, especially with the high number of traffic fatalities last year. “Each year during the campaign, student advocates reach thousands of their family members and classmates with the safe driving message, and we are glad to provide an avenue for them to share these important messages again this year,” Meeker said. Students and faculty at Washington Middle School in McCully will host a sign waving event in front of their campus on Thursday, Feb. 14 from 7 to 8 a.m. to promote safe driving. National speakers will also meet with select public schools throughout the week to discuss ways to prevent dangerous driving.